Not everyone is destined to be an artist. Only the gifted ones bloom and leave a legacy that which we call - that of an artist. Artists have specializations. Painters, sculptor, singers, theater actors, stage performers; name those specialties and you have it. I was amazed by fruit sculpture. 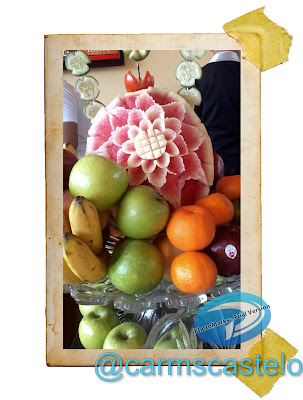 I saw this fruit sculpture as a centerpiece of an eat-all-you-can restaurant in Tacloban City. The fruits form part of the dessert. I would have been happier had I met the person who made it. As a lucrative business, fruits deteriorate soon. Unlike wood used for carving, fruits do not last long. Any mistake may mean a new one - a new raw material. I have read an article before about a Filipina whose expertise is fruit sculpture. I forgot her name but I understand she belongs to the circle of few talented people in her turf. I greatly admire people with skill as this. They belong to the chosen few and that they deserve all the accolades and recognition of my generation. Fruits indeed make artists.